Learn advanced techniques for treating pain and entrapment issues for the shoulder girdle, arms and hands. The course comes with DVDs and manual. As a special bonus, you’ll also receive instant access to the online eCourse for free (reg. $249). 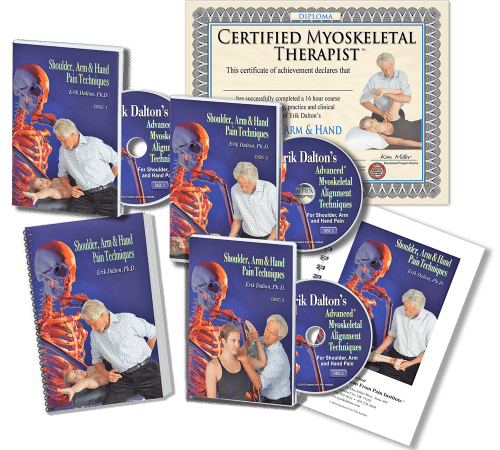 Using technique demonstrations, full-color illustrations, and academic explanation, the Shoulder, Arm & Hand Master MAT Certification course covers everything you need to know to begin addressing pain in the shoulder, as well as related issues in the arms and hands. You’ll learn to address myoskeletal strain and compensation patterns with an integration of sports therapy, structural integration and pain management techniques. With this home study version, you’ll be sent the Shoulder, Arm and Hand DVDs, printed manual and supplemental reading to study at home. As a bonus for purchasing the home study course, you’ll instantly receive access to all course material on our online learning platform. When you complete the test for this course, we’ll send you a certificate of completion to submit for your license renewal and to display on your office wall. You will earn 16 CE hours for your bodywork licensure, recognized by the National Certification Board of Therapeutic Massage and Bodywork and most State Licensing Boards. And you’ll be listed in our online directory of bodyworkers with the Shoulder, Arm and Hand Specialist Certification. Broaden your scope of practice to include advanced treatments for problems in the upper extremities with this detailed course.